The Model 49 Engine is a 70cc, 2 stroke single cyclinder engine. The simple but efficient engines consistantly offer 120 miles per gallon but are even more efficient when you combine pedal with petrol power. Ridley's aircraft aluminum engine mounts offer durability and comfort by isolating engine vibration through a rubber dampening system. 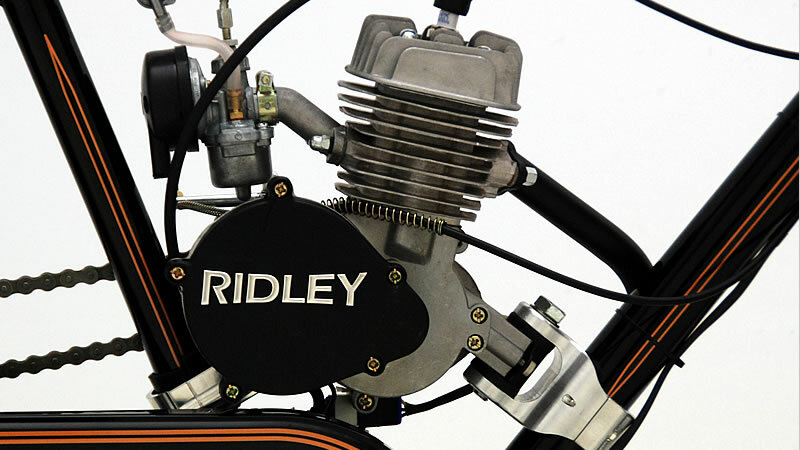 The engines are setup for installation into any of Ridley's Vintage Motorbikes. The Model 49 engine is capable of speeds around 34 mph. Engine Kit includes vintage exhaust, engine, clutch, extended primary drive sprocket, final drive chain, noise deadening material, pre-wired engine kill with quick disconnect plug. Requires installation estimated at 1 hour. The Model 49 Engine is currently available through Retailers and Online.